We check against the memuse counter. If it passes that check we increment the counter first, then we try to alloc. Definition at line 51 of file flow-util.c. References FLOW_CHECK_MEMCAP, FLOW_INITIALIZE, FlowStorageSize(), SC_ATOMIC_ADD, SC_ATOMIC_SUB, SCMalloc, and unlikely. Referenced by FlowInitConfig(), FlowSetupPacket(), FlowStorageRegister(), FlowUpdateSpareFlows(), and TagTimeoutCheck(). Definition at line 80 of file flow-util.c. References FLOW_DESTROY, FlowStorageSize(), SC_ATOMIC_SUB, and SCFree. Referenced by AppLayerParserStreamTruncated(), FlowShutdown(), FlowStorageRegister(), FlowUpdateSpareFlows(), and UTHFreeFlow(). 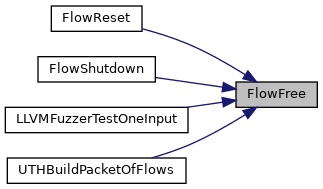 Definition at line 95 of file flow-util.c. References FLOW_PROTO_DEFAULT, FLOW_PROTO_ICMP, FLOW_PROTO_SCTP, FLOW_PROTO_TCP, and FLOW_PROTO_UDP. Referenced by AppLayerGetTxIterator(), AppLayerParserDestroyProtocolParserLocalStorage(), AppLayerParserGetEventInfo(), AppLayerParserGetEventsByTx(), AppLayerParserGetFiles(), AppLayerParserGetFirstDataDir(), AppLayerParserGetProtocolParserLocalStorage(), AppLayerParserGetStateProgress(), AppLayerParserGetTx(), AppLayerParserGetTxDetectFlags(), AppLayerParserGetTxDetectState(), AppLayerParserParse(), AppLayerParserProtocolGetLoggerBits(), AppLayerParserProtocolHasLogger(), AppLayerParserProtocolIsTxAware(), AppLayerParserProtocolIsTxEventAware(), AppLayerParserProtocolSupportsTxs(), AppLayerParserProtoIsRegistered(), AppLayerParserRegisterDetectFlagsFuncs(), AppLayerParserRegisterDetectStateFuncs(), AppLayerParserRegisterGetEventInfo(), AppLayerParserRegisterGetEventsFunc(), AppLayerParserRegisterGetFilesFunc(), AppLayerParserRegisterGetStateProgressFunc(), AppLayerParserRegisterGetTx(), AppLayerParserRegisterGetTxCnt(), AppLayerParserRegisterGetTxIterator(), AppLayerParserRegisterLocalStorageFunc(), AppLayerParserRegisterLogger(), AppLayerParserRegisterLoggerBits(), AppLayerParserRegisterLoggerFuncs(), AppLayerParserRegisterOptionFlags(), AppLayerParserRegisterParser(), AppLayerParserRegisterParserAcceptableDataDirection(), AppLayerParserRegisterProtocolUnittests(), AppLayerParserRegisterStateFuncs(), AppLayerParserRegisterTruncateFunc(), AppLayerParserRegisterTxFreeFunc(), AppLayerParserRestoreParserTable(), AppLayerParserSetStreamDepth(), AppLayerParserSetTxDetectFlags(), AppLayerParserSetTxLogged(), AppLayerParserStateCleanup(), AppLayerParserStreamTruncated(), AppLayerParserSupportsFiles(), AppLayerParserSupportsTxDetectState(), AppLayerProtoDetectUnittestCtxRestore(), AppLayerRegisterThreadCounters(), AppLayerSetupCounters(), DetectDnsQueryRegister(), DetectTlsFingerprintRegister(), DetectTlsIssuerRegister(), DetectTlsJa3HashRegister(), DetectTlsJa3StringRegister(), DetectTlsSerialRegister(), DetectTlsSniRegister(), DetectTlsSubjectRegister(), DetectTlsValidityRegister(), FlowInit(), FlowSetProtoFreeFunc(), FlowShutdown(), FlowUpdateState(), RegisterDCERPCUDPParsers(), and TagTimeoutCheck(). Definition at line 111 of file flow-util.c. References FLOW_PROTO_ICMP, FLOW_PROTO_SCTP, FLOW_PROTO_TCP, FLOW_PROTO_UDP, Flow_::icmp_d, Flow_::icmp_s, ICMPv4GetCounterpart(), and ICMPv6GetCounterpart(). Referenced by AppLayerParserThreadCtxAlloc(), and AppLayerParserThreadCtxFree(). Definition at line 147 of file flow-util.c. References COPY_TIMESTAMP, Flow_::dp, Flow_::dst, Flow_::flags, FLOW_IPV4, FLOW_IPV6, FLOW_SET_IPV4_DST_ADDR_FROM_PACKET, FLOW_SET_IPV4_SRC_ADDR_FROM_PACKET, FLOW_SET_IPV6_DST_ADDR_FROM_PACKET, FLOW_SET_IPV6_SRC_ADDR_FROM_PACKET, FlowGetProtoMapping(), Flow_::icmp_s, Packet_::icmp_s, Packet_::icmpv4h, Packet_::icmpv6h, IPV4_GET_IPTTL, IPV6_GET_HLIM, Flow_::max_ttl_toserver, Flow_::min_ttl_toserver, PKT_IS_IPV4, PKT_IS_IPV6, Flow_::proto, Packet_::proto, Flow_::protomap, Flow_::recursion_level, Packet_::recursion_level, SCEnter, SCLogDebug, SCReturn, Packet_::sctph, SET_SCTP_DST_PORT, SET_SCTP_SRC_PORT, SET_TCP_DST_PORT, SET_TCP_SRC_PORT, SET_UDP_DST_PORT, SET_UDP_SRC_PORT, Flow_::sp, Flow_::src, Flow_::startts, Packet_::tcph, Packet_::ts, Packet_::udph, Flow_::vlan_id, and Packet_::vlan_id. Referenced by FlowGetFlowFromHash(), and FlowSetupPacket().